You know how I’m always starting my stories with “What problem are you trying to solve?” Before you decide whether to go for a traditional single router or one of these fancy new mesh routers, you really should think about the problem you want to solve, because this is definitely not a one size fits all problem. In August of 2016, I bought a Netgear Nighthawk X8 router to replace my aging Airport Extreme. This was before the current mesh router craze happened, and I’ve wondered for a long time whether I made a mistake buying this router too early. Maybe I should have waited until the mesh routers matured. I met with Netgear at CES and happened to mention I was thinking of testing a range extender with my Nighthawk X8. The rep told me to not even consider buying one. He said that the only good solution for dead spots in your home is to go with a mesh router. I told him I was interesting in testing out their mesh router system. Netgear was kind enough to send me their Orbi AC3000 mesh router to fly off against my Netgear Nighthawk X8. My idea was to replicate the tests I ran in 2016 when I bought the Nighthawk X8 where I compared it to the poor old Apple Airport Extreme. As I explained in detail in my article in 2016, testing the WiFi signal of a router is much trickier than just launching a speed test app. If you use one of those apps or websites, you’re muddying up your data with local network congestion from your neighbors, peering agreements between ISPs, server speeds on the other end, etc. If you really want to create an accurate map of the real speed of just the WiFi signal, you need to use a different method. In my blog post on my tests in 2016, I explained how I used a command-line tool called iperf to test the true WiFi speed of our routers. First, you hardwire one computer to the router using Ethernet. Then you connect a laptop to the same router but over WiFi. The hardwired computer becomes the server, and the WiFi-connected laptop is the client. You launch iperf from the server side first, and then from the client side you run iperf connecting to that server. This setup means you’re only testing the speed of the WiFi from the location of the laptop to the router itself. Every time you run iperf, it takes 10 samples and gives you an average WiFi speed. I took 5 tests at each location around the house, so that’s 50 samples at each location. I tested at 5 different locations around the house upstairs and 5 downstairs. In all, that’s 500 tests and I think that’s an adequate sample set, don’t you? My strategy was to test the Orbi at the same locations where I tested the Nighthawk X8 a year and a half ago, but not to retest the X8. I did take a few samples of the Nighthawk X8’s speed just to make sure things hadn’t changed since I last I tested it. The samples I took matched with what I got before so I didn’t sample the X8 500 times again. Now it was time to play with the Netgear Orbi mesh router system. The unit Netgear shipped to me is the Orbi AC3000 that comes with a router and one satellite (but you can buy more satellites). This configuration is designed to bathe a house in WiFi of up to 5000 square feet. Each unit is a white oval shape, 9 inches tall, 6 inches wide and only about 2 inches deep, with a ring of light around the top. Setup is pretty easy, with the typical dance of turn it on, connect to the device’s WiFi using a barcode on a sticker on the device, then let the device find the Internet. I say pretty easy because I made the same bonehead mistake I make every time I set up a device like this. When I connected to the WiFi network of the Orbi, my VPN didn’t trust it (which it shouldn’t because it’s never seen it before) so I couldn’t complete the configuration. This is no fault of Netgear, and it’s certainly no fault of my VPN service, rather it’s my fault for forgetting about it. Maybe I’ll never learn but perhaps if I keep telling you this story over and over again, YOU won’t forget to shut off your VPN! Anyway, if you’re smarter than me, it’s a few steps using your smart phone (or computer) to connect to the router, and then plug in the satellite unit where you want to have the extra coverage in your house. When the satellite pairs to the router, the ring of light on the top will turn different colors to tell you whether it’s too far away from the main unit. We did have to muck about with the satellite to get it to pair at first, resetting and starting over a couple of times, but finally it behaved itself and we were in business. During testing I moved the satellite to a couple of different locations and reran the tests until I got the best performance out of the Orbi mesh system. I have to say, I was quite surprised at the results of the testing. The Nighthawk X8 beat the Orbi at an average speed of 338 Mbps vs. 175 Mbps, so the Nighthawk X8 was 1.9 times as fast on average. The maximum speed was 1.5 times faster with the Nighthawk X8 and the minimum was 4.7 times as fast as the Orbi. My first thought was that I must have done something wrong. I checked in with Dave Hamilton of the Mac Observer who has practically done a doctoral dissertation on mesh routers over the past year or two. He published the results of his tests of eero vs Orbi vs AmpliFi in late 2016, and he wrote a great article at the end of last year with his suggestions of how to choose the best mesh wireless system for your home. I explained my testing process and my test results and suggested one of two explanations for my findings. A) Allison is a moron and made some critical error in testing process, or B) The radios/antennas in the Nighthawk X8 are so powerful and sensitive that they overshadow the benefits of a mesh router. I ran the same questions past my contact at Netgear. At this point in the story I have to explain something that I learned from listening to Dave talk about routers on the Mac Geek Gab. When you buy a router nowadays, they often have a model number in the format of AC (which means it supports 802.11ac) followed by a four-digit number. That number is the sum of the speed of each of the radios in the router. I know, you can’t add the speeds together to represent the WiFi speed you actually get, that makes no sense, but that’s what the industry has settled on as a metric to compare router speeds. Let’s do this by example. The Nighthawk X8 I told you was the AC5300. It has three radios: two 5 GHz and one 2.4 GHz. The two 5 GHz radios each provide a theoretical speed of 2166 Mbps and the 2.4 GHz radio is supposed to provide 1000 Mbps. If you add 2166 + 2166 + 1000 together you get around 5300, hence the nomenclature of AC5300. 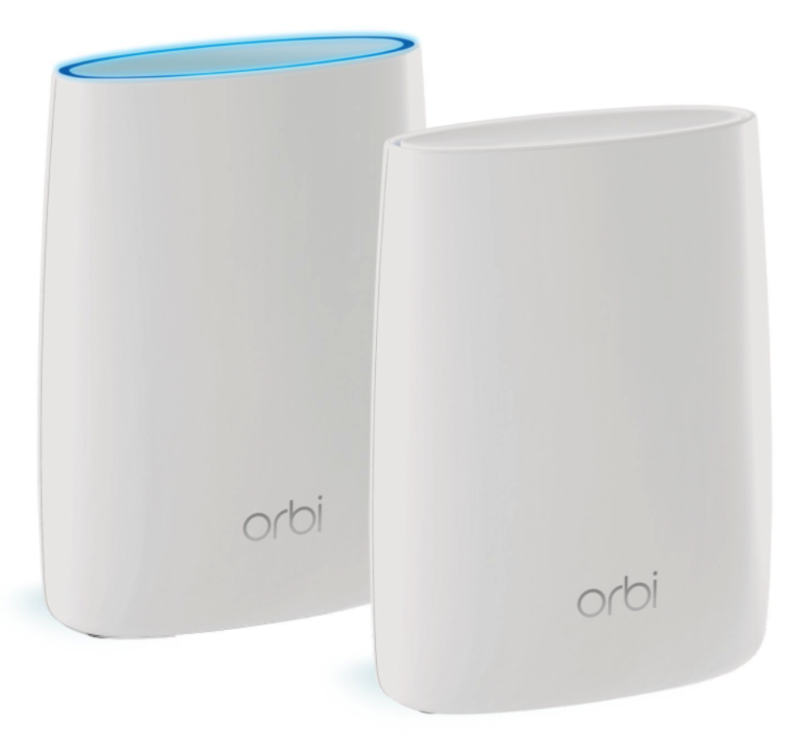 The Orbi from Netgear is an AC3000. Again it has two 5 GHz radios and a 2.4 GHz radio, but the 5 GHz radios don’t have nearly as much power and one is faster than the other. The three radios together are 1733 + 866 + 400 Mbps = AC3000. Now you know, and I know, that adding those numbers together doesn’t tell you a darn thing about the speed, as I said before. 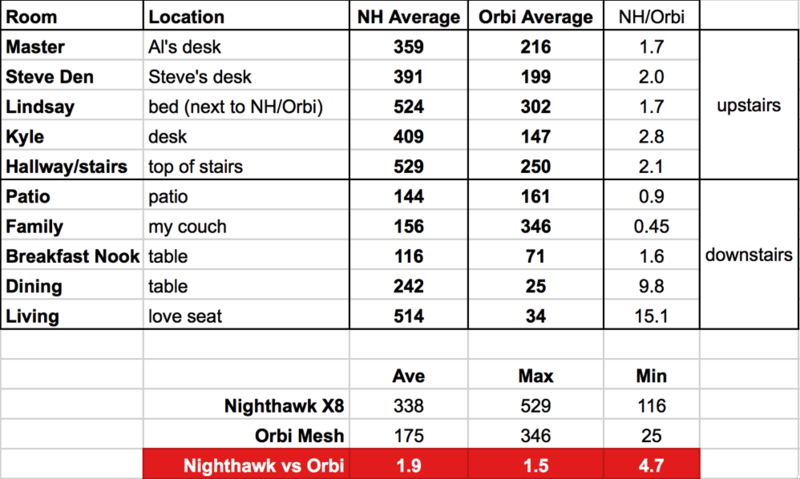 If we just look at the fastest radio on each router, the Nighthawk X8 is 2166 Mbps vs. the Orbi at 1733. But it turns out you can’t even compare the two fastest radios. When I put the question to Dave and to Netgear, they both explained something interesting. They said that the Nighthawk X8 has 4×4 radios and even though the first machine I tested with in 2016 only has 2×2 radios in it, the signal from the router will be the best of the 4×4, and that it makes a big difference in speed. Even more interesting, my contact from Netgear explained that the Orbi uses the fastest radio for what they call “backhaul” which is the communication between the Orbit router and all of the satellites. That means the radio we’re using for my tests walking around the house is the 866Mbps radio. Before you start thinking, “man that’s the SLOW one”, it’s 866Mbps, or nearly gigabit! But if you compare the 2166Mbps on the Nighthawk X8 to 866MBps on the Orbi, that’s a factor of 2.5. This could easily explain the speed difference between the two routers. If you’d like to learn more about what 4×4 radios even means, don’t come knocking on my door. It’s the road to madness, and Dave has traveled that road, so listen to the Mac Geek Gab and read his articles on The Mac Observer. In any case, I was delighted to learn that I hadn’t made a huge technical error in my testing process, but rather learned a lot more about how these routers work and why the Nighthawk X8 beat the Orbi, in my house. But Which Should You Buy? Remember I started this fly off by asking what problem are you trying to solve? Well let’s talk to that in hopes of helping guide any decision you may make on this. I’ve decided that my square, two-story house, and more importantly my ability to put my router in the center of my house, makes this a configuration that doesn’t need a mesh system. With a single (powerful and sensitive) router, the worst room in my house is getting 116 Mbps, which is faster even than my wicked-fast FiOS Internet, and surely way faster than any web services I visit. A better house to take advantage of a mesh router like the Orbi from Netgear is where you have a long floorpan, or in a house where the router and modem have to be up against an exterior wall on one side. These configurations are much more likely to have dead spots far from the router. My daughter Lindsay just bout a 2400 square foot house (close to the same size as mine) but it’s essentially all on one floor so it’s REALLY long, with the modem at one far end. She also has a 900 square foot basement (I’m so jealous). I put the Orbi AC3000 in her house with the router at one end and the satellite about 2/3rds of the way down the house, and their entire home now has great WiFi service throughout. She told me recently that her only regret is that I put the Orbi in place on day one in their new house, and didn’t make her suffer with her old Airport Extreme first so she’d appreciate the Orbi more. The two models of routers I tested are nearly the same in price. The current model of the Netgear Nighthawk X8 AC5000 will run you $250 on Amazon while the Netgear Orbi AC3000 for a 5000 square foot home will cost you $292 on Amazon. So price isn’t a differentiator here, it’s all about the problem you’re trying to solve. 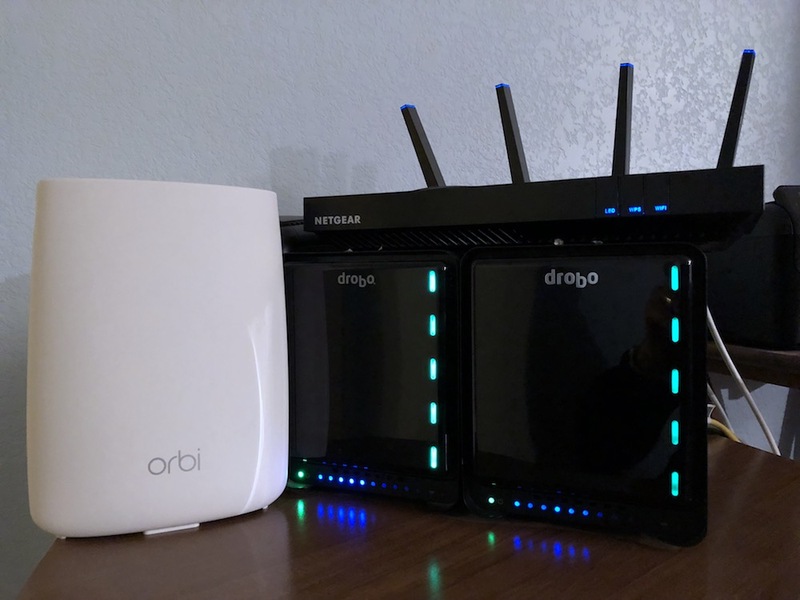 I think if you have a lot of trouble getting coverage at distant spots in your home, and you’ve tried messing around with wireless range extenders that never worked, the Orbi mesh router system is a great choice. It’s relatively easy to set up and gives good coverage. The other consideration is that with the Orbi, you can buy more satellites to put in even harder to reach areas of your house, extending your range even farther. A satellite that extends the range another 1500 square feet will cost you another $140 on Amazon. Netgear even sells an outdoor version of the Orbi Satellite. If, however, you don’t have dead zones at a distance in your home, you might actually get better speeds with the Netgear Nighthawk X8 AC5000. I’ve struggled with this problem for a year or so and cannot come to a proper decision. My house has a squareish footprint with about 1400sqft and is 2 floors but the router is against an outside wall and we have a couple of rooms that aren’t covered by my very old Airport Extreme (the flat one) so in the end I bought a couple of Devolo ac1200+ powerline extenders and they seem to work ok. My broadband is a maximum of 75Mbps and I get about 1/4-1/2 of that everywhere now. I have thought about getting a honking big powerful router or a mesh but am unable to decide so I never change. The old Airport is probably not going to be supported by Apple for long and so I should probably make the jump but I read the reviews of every device on Amazon an other sites and end up being put off by tales of misery. So I’m stuck! Woe is me! you should try the Linksis Velop, now sold by Apple. I have installed 6 of these recently. They are amazing. Thanks, Barry, I know Linksys has always made good stuff. My purpose wasn’t to test all mesh routers, it was to determine whether a mesh router was better than a powerful single router. For testing all of the mesh routers, I’ll leave that to Dave Hamilton (well down that road to madness. This is an important article – it reveals a truth that marketing departments would rather you not know. If there is a central location in your home such that you can get a signal from every location, then there really isn’t a need for a mesh. Just look for the best Wi-Fi access point you can afford and put it in that location. It’s only when your home is too big for a single AP (like mine, which is two stories plus a basement, with (signal-blocking) ducts in the walls) that you need to start considering multiple APs. In this situation, it’s not a choice of whether to use a mesh instead of a single router, but a choice of whether to use a mesh instead of a bunch of routers. In my home, I have three routers. One built-in to my cable modem and the other two configured for bridge mode (making them dumb access points). I have them bridged together via powerline network adapters and place them in three corners of the house in order to get good coverage. Since they’re all configured for the same SSID and password, I can “roam” about the house and it mostly works. A mesh system would be an alternative to this – allowing for easier configuration (one central point to configure and upgrade it all) and potentially easier roaming (less interruption when switching between APs). But both solutions (mesh or three routers) are better than a single router for my home, because there is no one place that can cover all the space. And in a smaller home, where one location can cover everything, a single high-capacity router would definitely be better. Thanks, David. Many people have noted that a small house doesn’t need mesh, but my measurements show it’s not just that size matters (couldn’t resist). My home is 2800 square feet, which is pretty good, but the shape of the house (giant cube) and the fact that my main router is easily located pretty close to the center, AND that I don’t have a lot of metal shielding (like lathe and plaster walls), so a centrally located, powerful, tri-band router works well for me. Here’s another benefit of a non-mesh router system. You can separately name the 2.4GHz and 5GHz bands. This is essential when adding IoT devices to the network. With a mesh router, my understanding is that you have to trick the router by getting as far away from it as possible so the device will only see the 2.4GHz network and then connect properly. I haven’t tested this yet myself but it’s on my to-do list.